Chelsea manager Antonio Conte says "everything is possible" regarding his future at the club. Conte, 48, has been linked with a move to Paris St-Germain and a number of rival managers have been linked with his job at Chelsea. He led the club to the Premier League title last season and his contract at Stamford Bridge runs until June 2019. "In one moment you stay here, in another moment another person replaces you," said Conte. The Italian's position has been the subject of speculation over a rumoured frustration regarding transfers. "For the manager of this club it's normal to have this type of situation," said Conte. 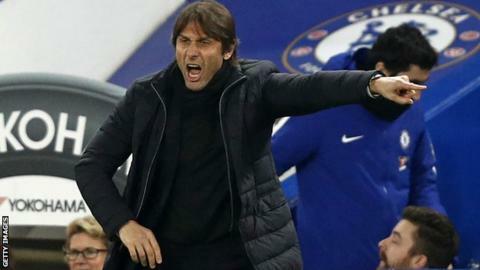 Chelsea are 16 points behind Premier League leaders Manchester City and Conte feels he has been under pressure since very early in the season. "I have a lot of experience to deal with this type of situation," said Conte. "But there is something strange if, after the first game we lost against Burnley, the press pushed quickly to sack me for another coach. "I think in other clubs this doesn't happen. In this case, I think the club has to decide to send me away."